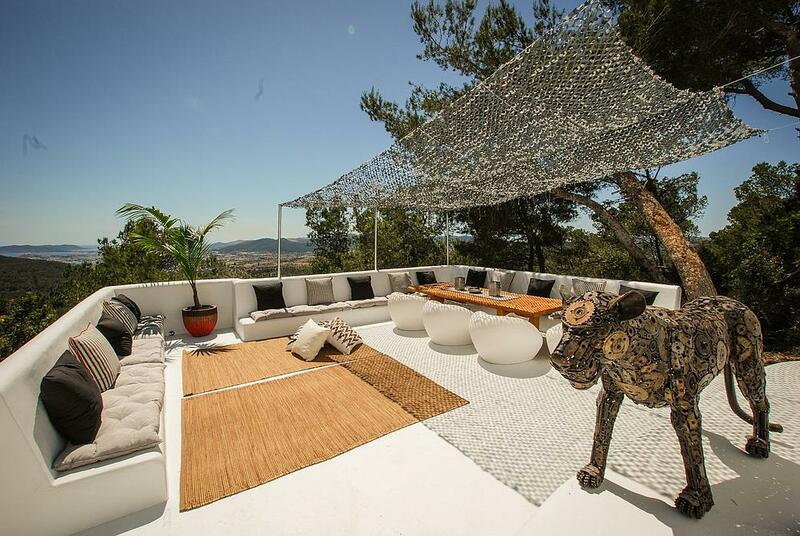 This luxurious 5 bedroom villa is situated 1 km from the much sought after area of Can Furnet, just a short distance from the village of Jesus, the beautiful Talamanca beach and just 3.5 km to Ibiza Town. 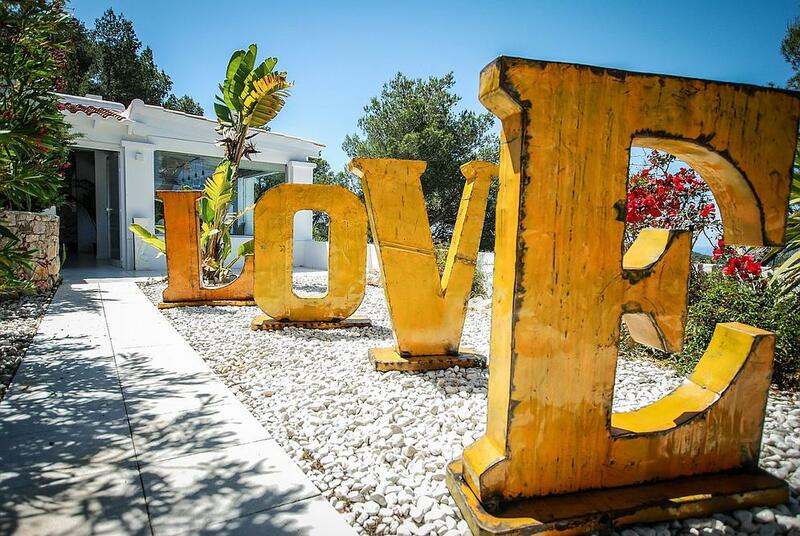 Jesus is a beautiful village with all the amenities you need such as supermarkets, banks, bars and restaurants. 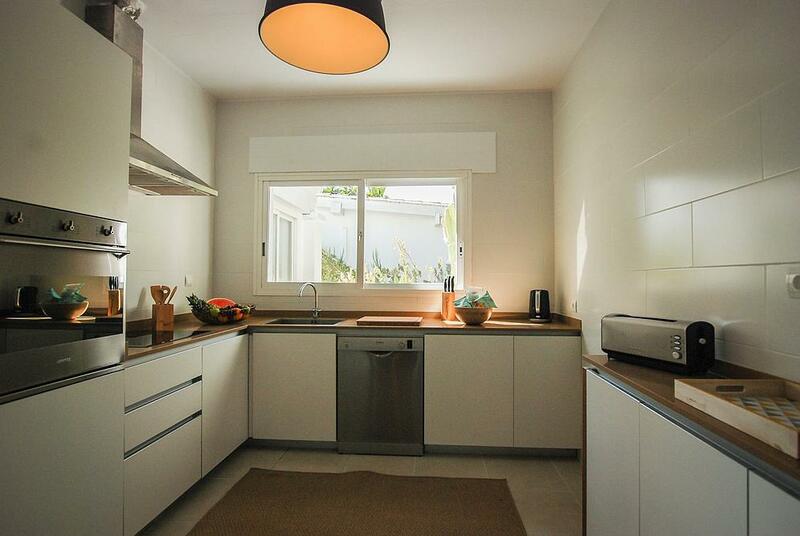 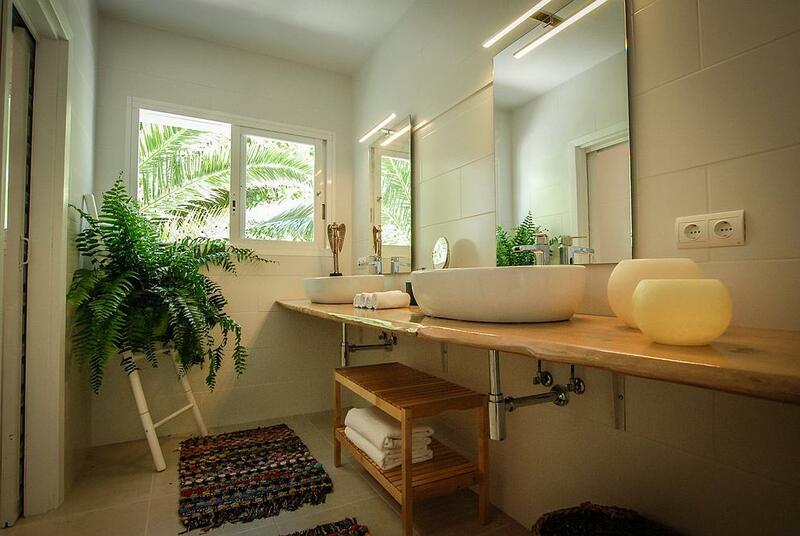 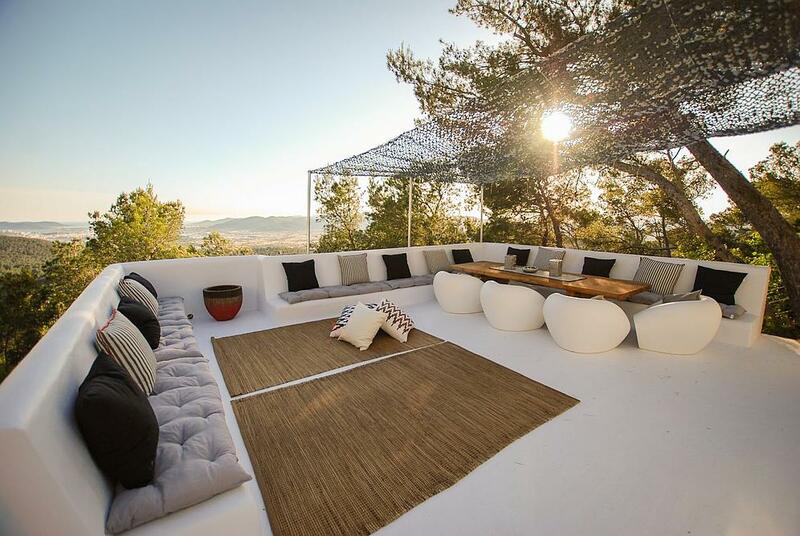 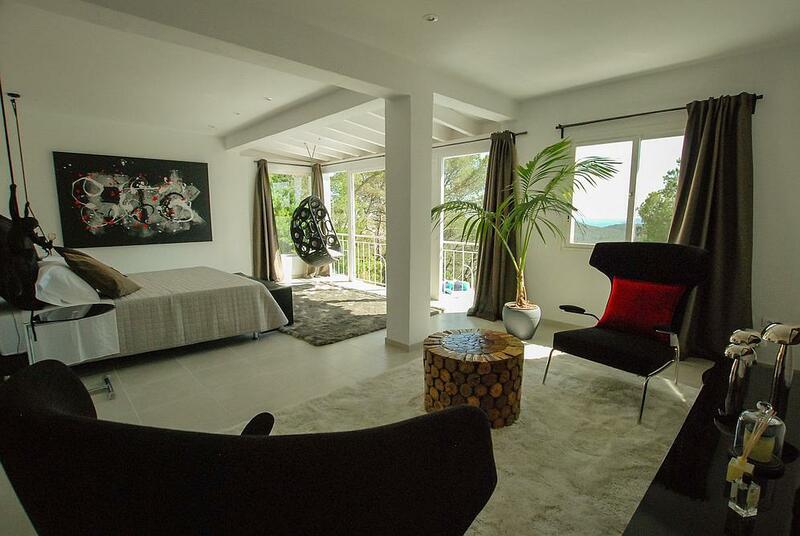 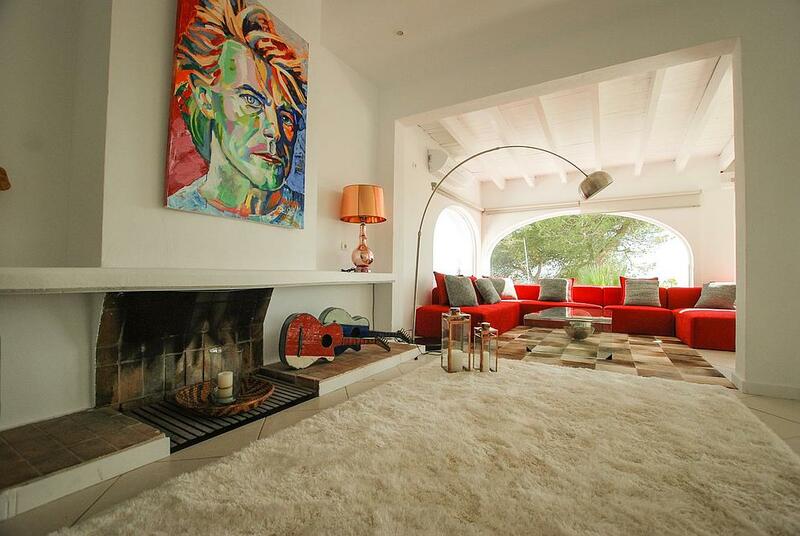 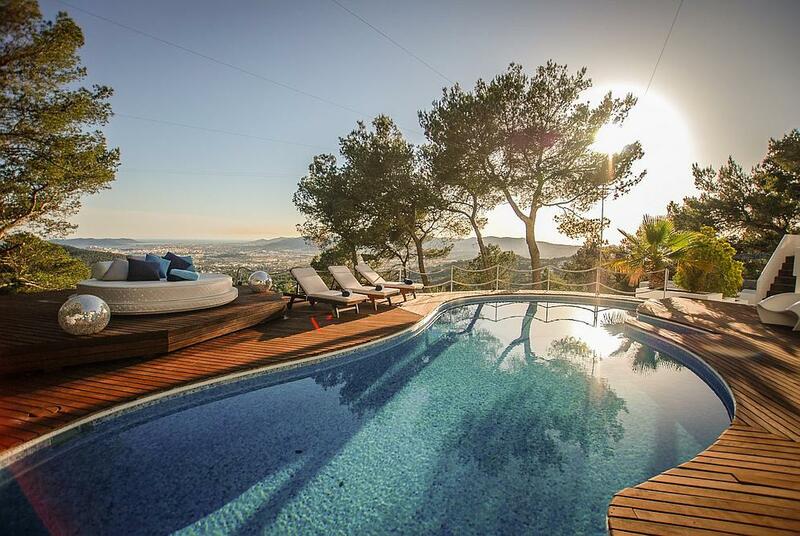 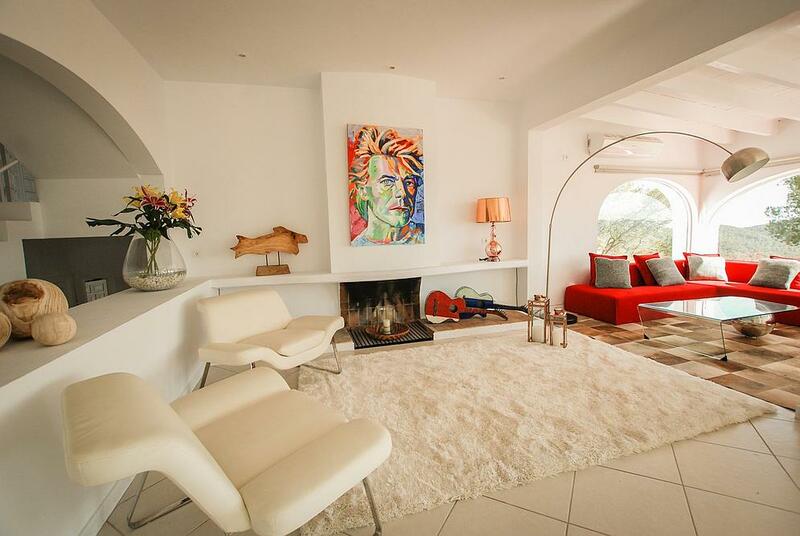 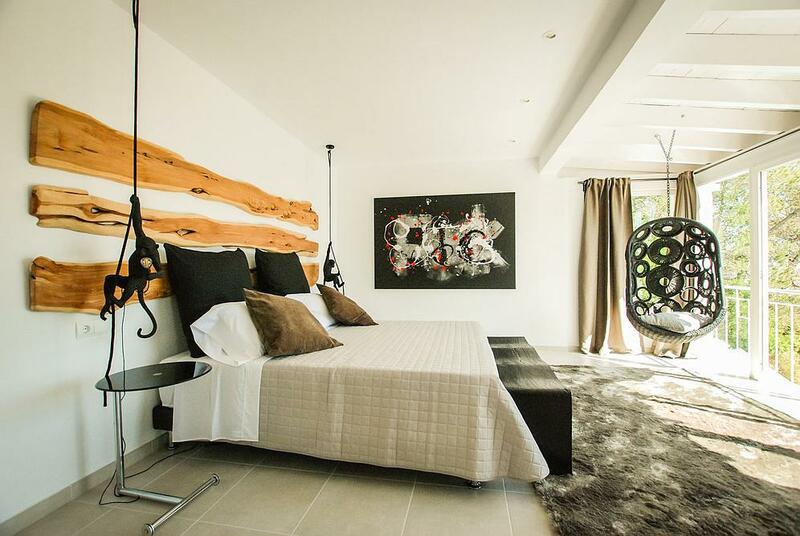 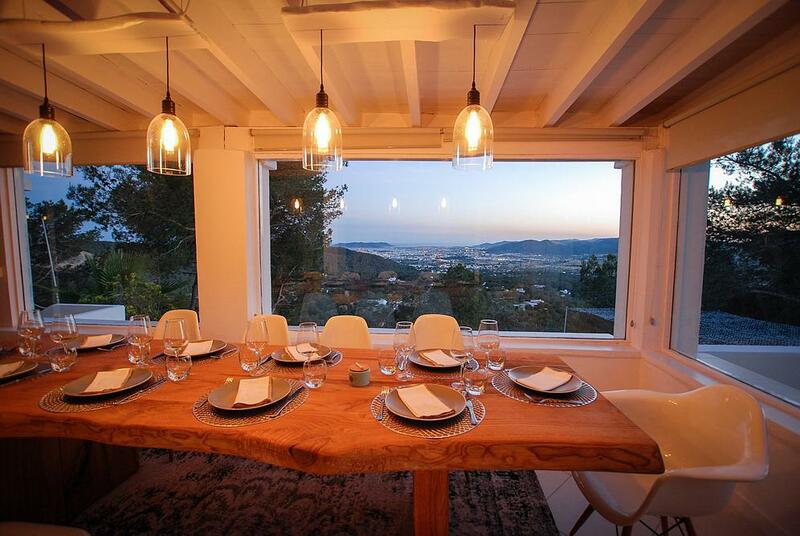 With 350 m2 of space distributed over 3 floors and breathtaking views from the top of one of the highest hills in Ibiza, this is the perfect holiday retreat. 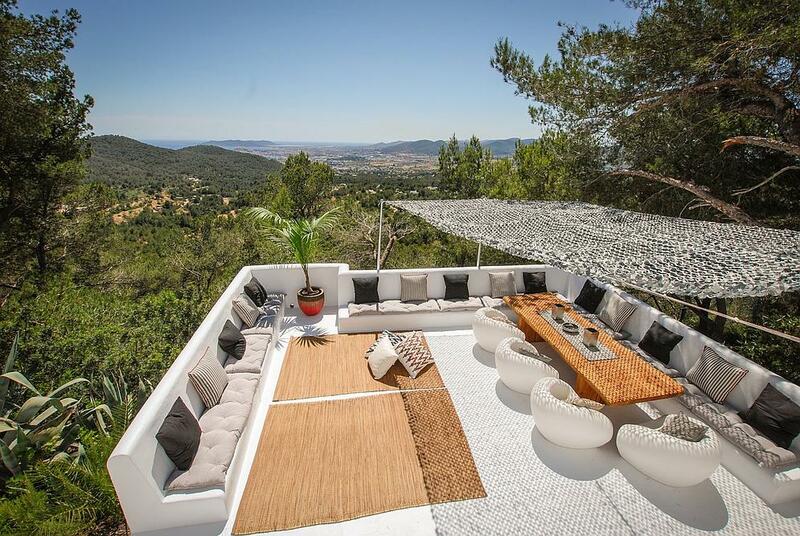 OUTDOOR AREAS Positioned in a perfect location, this property offers stunning sea views to Formentera, Dalt Vila, Playa Den Bossa and the Salinas salt flats. 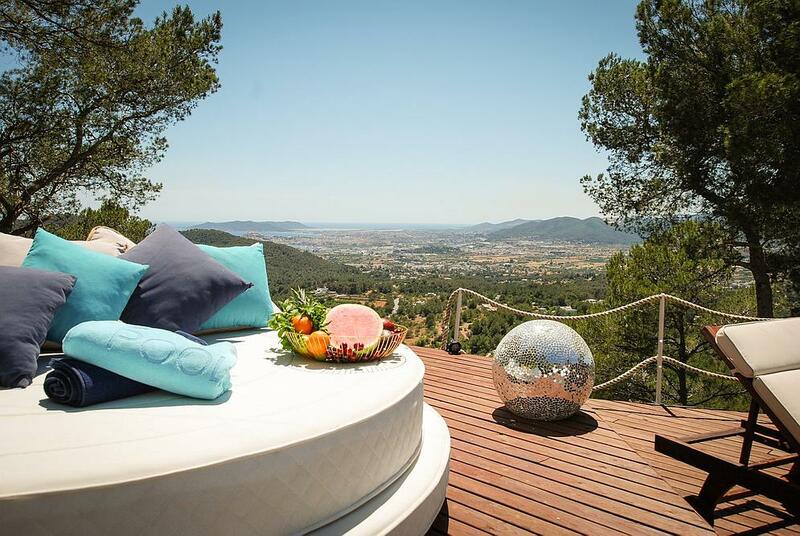 There is a fantastic chill-out terrace with an outdoor dining area, perfect for family gatherings or romantic dinners whilst enjoying the views. 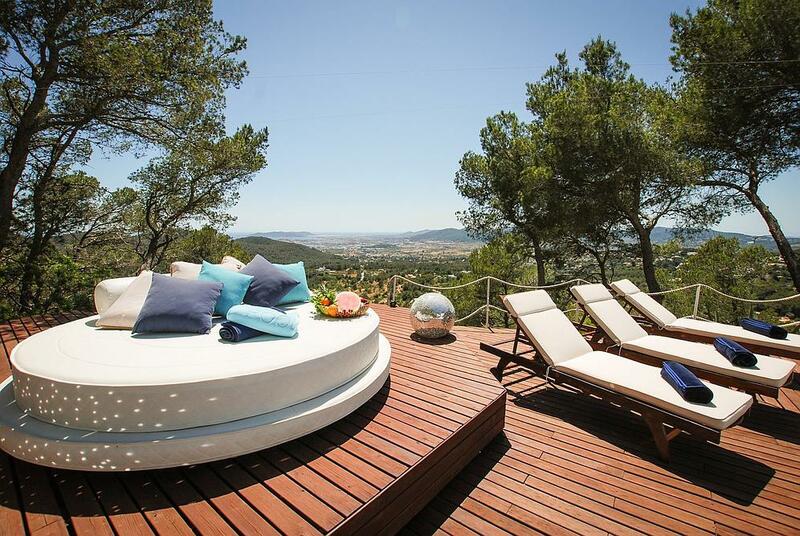 The large swimming pool is set in a wooden decked area and is surrounded by sun loungers and a luxurious day bed. 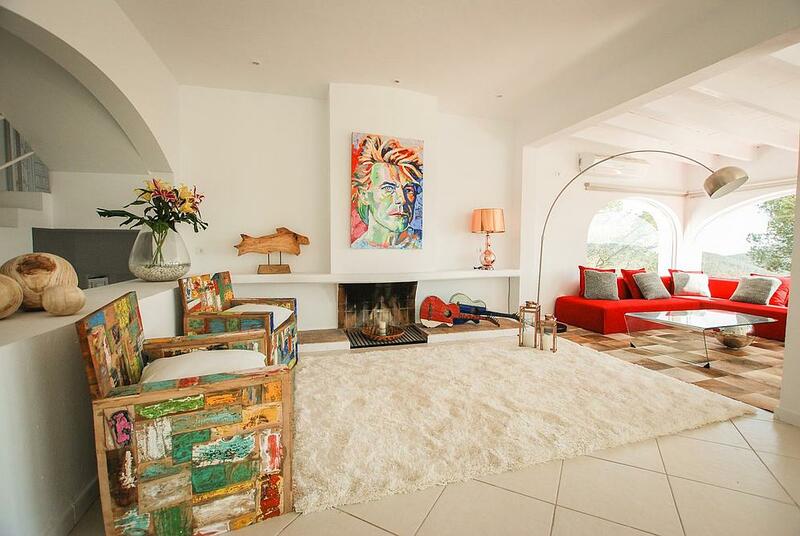 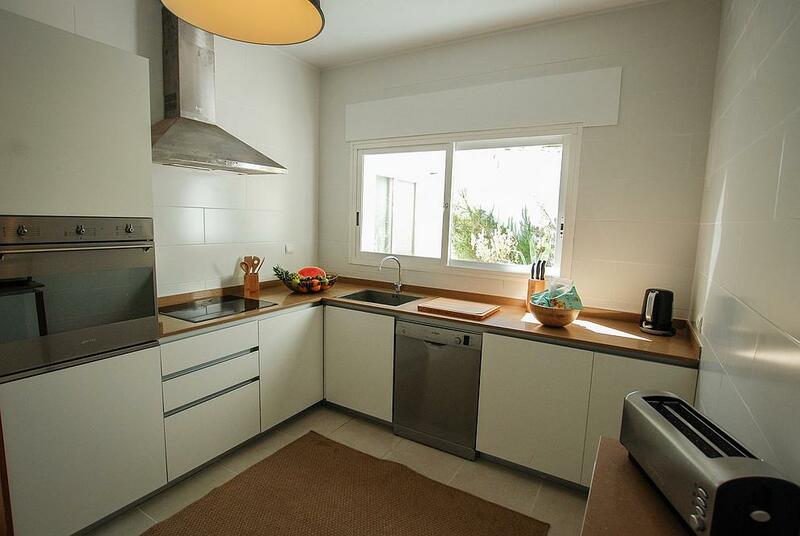 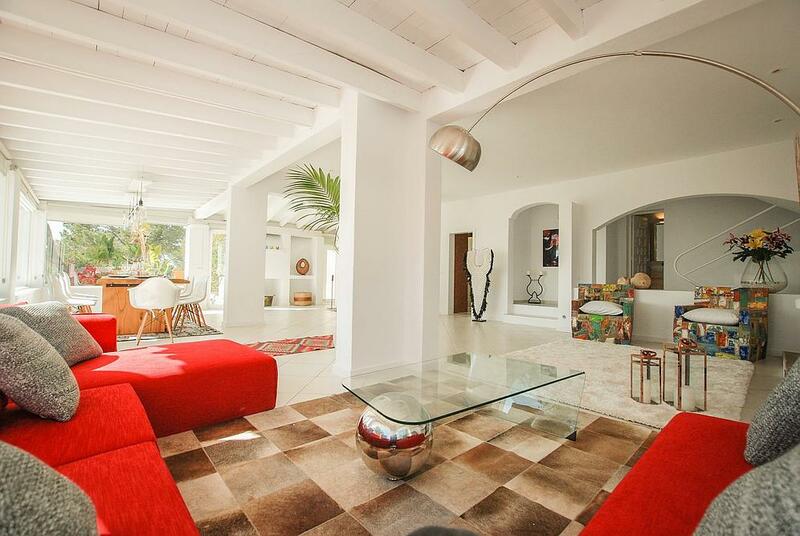 LIVING AREAS There is a large tastefully furnished open-plan living area with generous seating, benefiting from large windows facing the stunning view of Ibiza Town and the coast from the beach of Talamanca up to Salinas. 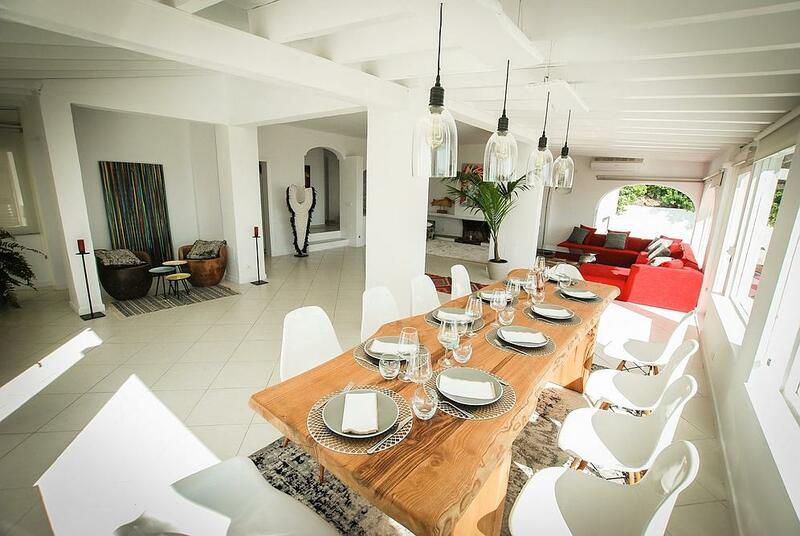 The dining area easily seats 10 people and also boasts fantastic views and the fully equipped modern kitchen is fitted with all modern appliances. 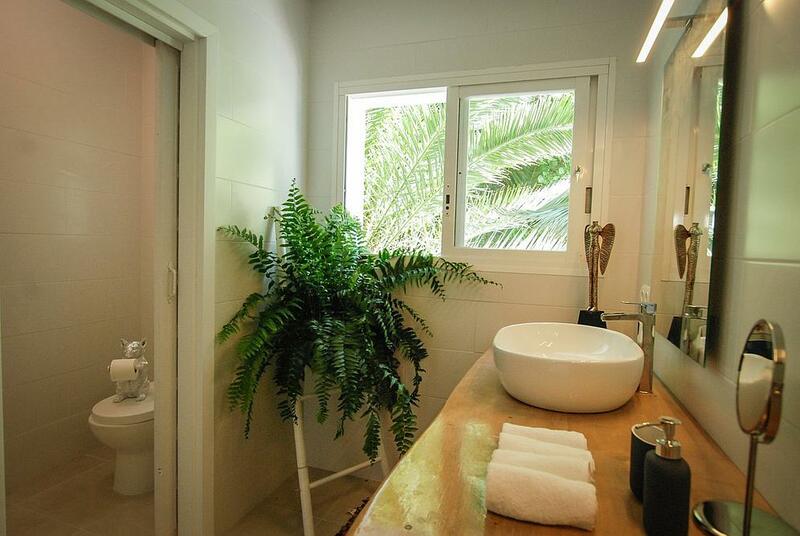 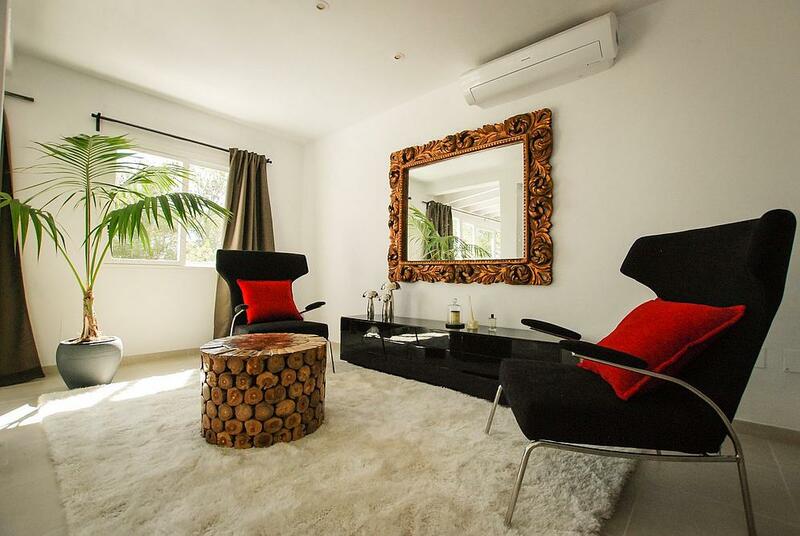 The whole villa is equipped with air conditioning, WiFi and satellite TV. 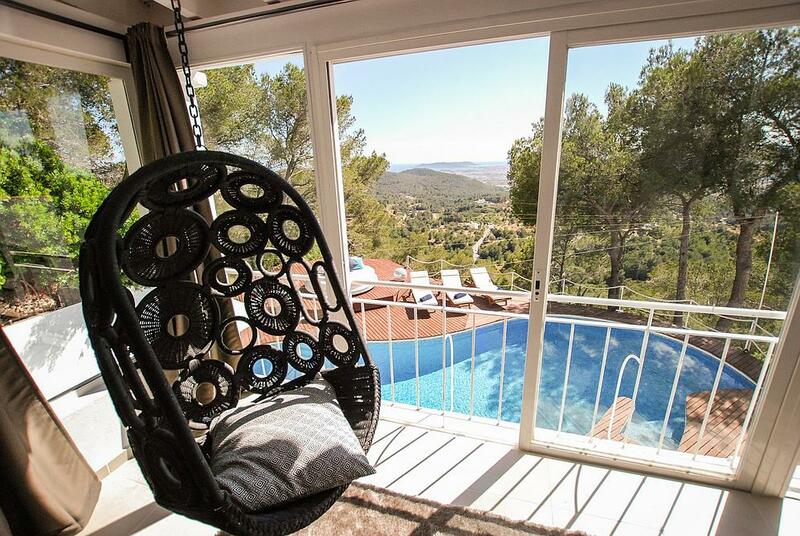 With 350 m2 of space distributed over 3 floors and breathtaking views from the top of one of the highest hills in Ibiza, this is the perfect holiday retreat. 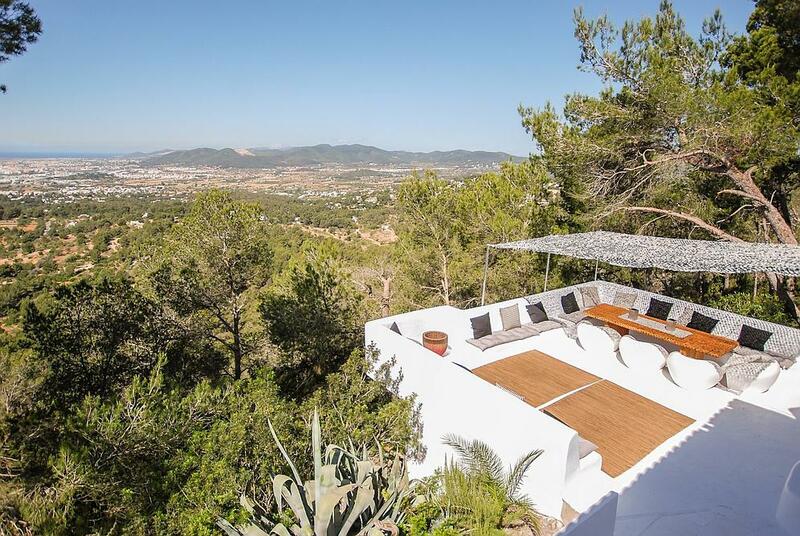 OUTDOOR AREAS Positioned in a perfect location, this property offers stunning sea views to Formentera, Dalt Vila, Playa Den Bossa and the Salinas salt flats. 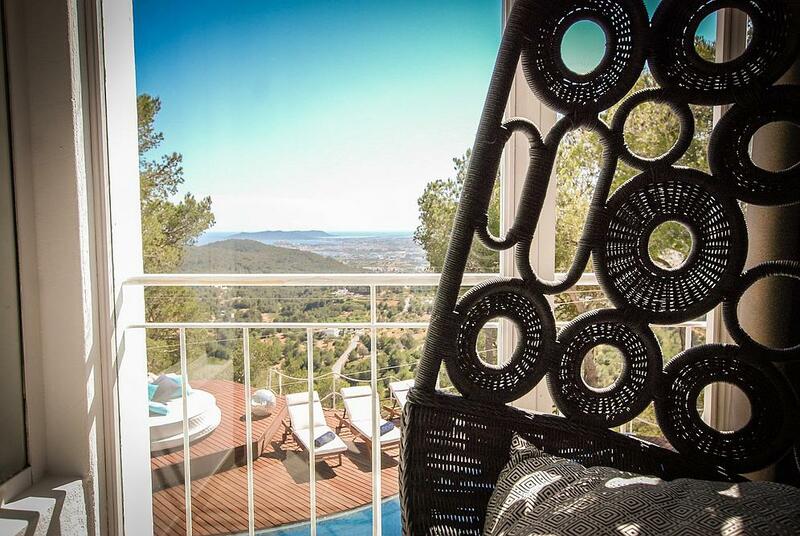 There is a fantastic chill-out terrace with an outdoor dining area, perfect for family gatherings or romantic dinners whilst enjoying the views. 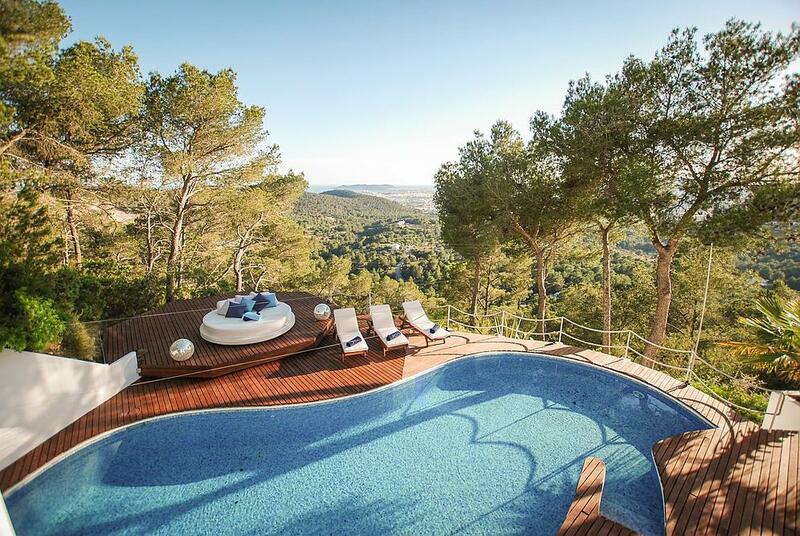 The large swimming pool is set in a wooden decked area and is surrounded by sun loungers and a luxurious day bed. 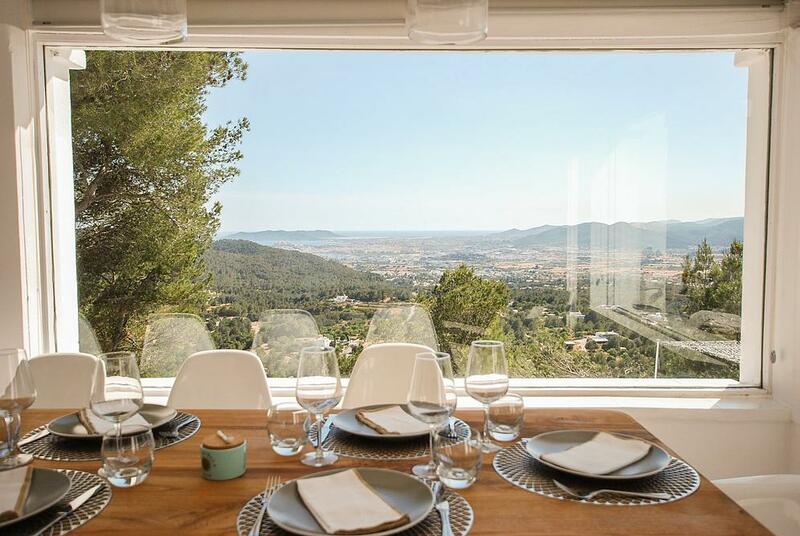 LIVING AREAS There is a large tastefully furnished open-plan living area with generous seating, benefiting from large windows facing the stunning view of Ibiza Town and the coast from the beach of Talamanca up to Salinas. 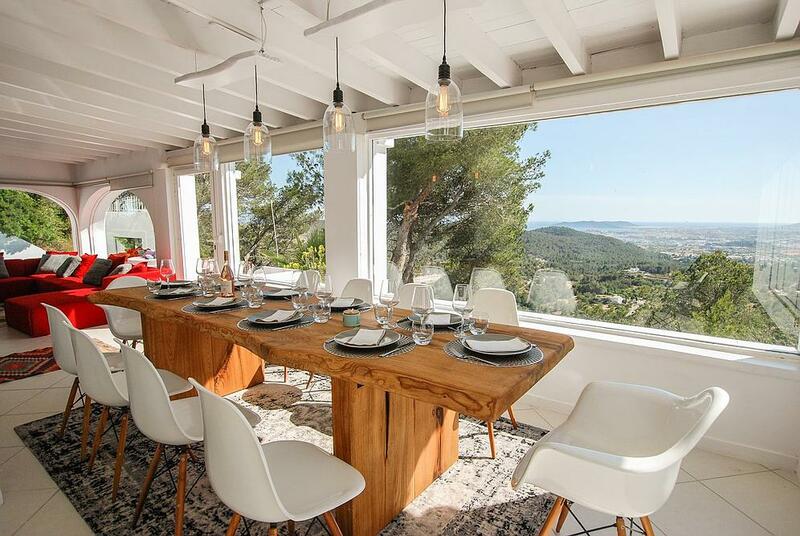 The dining area easily seats 10 people and also boasts fantastic views and the fully equipped modern kitchen is fitted with all modern appliances. 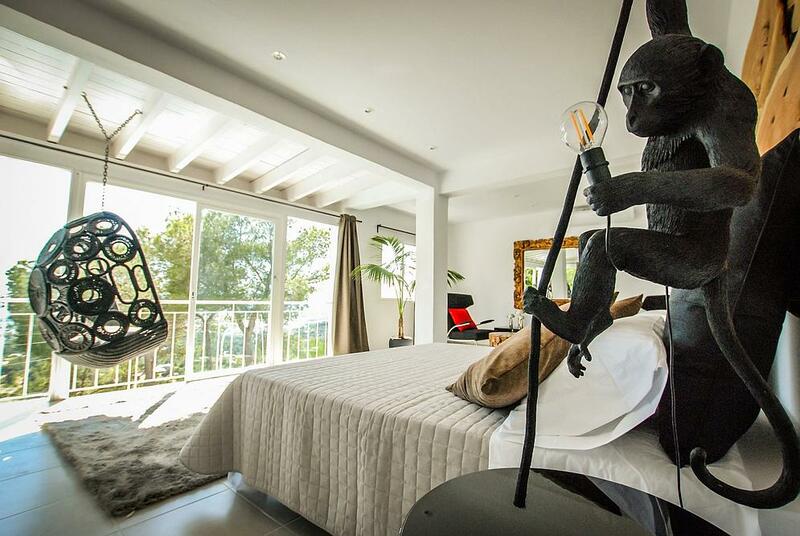 The whole villa is equipped with air conditioning, WiFi and satellite TV.